In warm weather, the risk of blossom end rot rises. 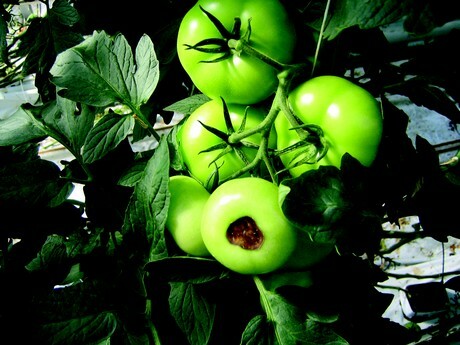 That is why Biobest recommends treating susceptible tomato varieties with Bluestim. Biobest advises to apply Bluestim at a rate of 2 kg/ha (1.8 lb/acre). It is important to repeat the treatment, every three to four weeks, to maintain continuous protection while conditions remain favourable to this disorder. This osmotic regulator contains glycine betaine which is absorbed by the plant within 24 hours of application. Bluestim regulates the osmotic pressure within the cell and the water and nutrient exchange, improving calcium mobilisation. It maintains the integrity of the plants cell wall membrane preventing water loss and cell burst. This is how Bluestim naturally protects plants against all kinds of environmental stress and prevents physiological disorders, such as blossom-end rot. What's more, experience in the field has shown that this treatment results in even shinier tomatoes.